Students say they're confident in their roles, their directors and the show’s production three weeks before opening night. For Amanda Stefanowicz, her lead role in Keystone Oaks’ “Fame The Musical” is an example of art imitating life. While the talented Castle Shannon senior is set to study at Allegheny College in the fall, pursuing a career as a math teacher, and doesn’t share the New York dancing dreams of her character Mabel Washington, she finds symmetry in their places in life. “The last scene of my last high school show is a graduation scene,” she said. That’s not lost on director Shane Hallam. “This show speaks to what it’s like to be a teenager and what they go through, and it shows what teachers go through,” he said. Both are fresh perspectives for Hallam, who graduated from high school seven years ago and has been serving as a permanent substitute teacher at Keystone Oaks. Dual certified in English and history with degrees from Ohio State University, he teaches history, social studies and writing to high school students. If perfectly producing a musical that explores themes of multicultural identity, race and homosexuality is Hallam’s vision, staging director Mike Viola is the man bringing that vision to life. “I want every scene you see to be like looking at pictures in a photo album,” said Viola, a substitute teacher for English classes at Keystone Oaks. Though Viola graduated from Chartiers Valley a year behind Hallam and the two were friends then, they lost touch while at rival universities and didn’t meet up again until they both walked through the doors of Keystone Oaks. “He definitely produces this show, but he gives me full artistic freedom. That means the world to me,” Viola said. The working relationship between Hallam and Viola has been described as collaborative and inspiring by the 38-member cast. “It teaches all of us how to work together better,” said Dormont freshman Molly Young, who plays Serena Katz, an aspiring actress. Hallam "is so easy to talk to, so personable. He makes you want to do well and brings out the best in everyone by being positive and not mean,” Young said. Viola "is an absolute genius. He takes something and makes it perfection. He brings out energy in us we didn’t know we had,” she said. Rounded out by vocal director Kate Queen, the show’s managers led the first costume rehearsal on Saturday and were impressed with how far the show has come. “This experience has been so awesome and so humbling. Some of these students have been singing their whole lives, and some have never sung before. Teaching them has been another way for me to learn. To see what they can do today is amazing,” said Queen, who studied music at New York University and Ohio University and is pursuing a master’s degree in institutional leadership at Robert Morris University. The directors and cast said they are excited for opening night at the end of month, and Hallam added that there is some pressure. 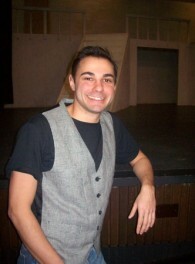 He is the third director in three years that the district has hired, and he’s entered the show for consideration in the Gene Kelly awards. “You’re always excited to see the finished product come to life, but there’s that underlying nervousness because you want to be sure you’re putting on the best show you can,” Hallam said. His students, though, have never picked up on that nervousness. “He is a very kind man and is always so positive,” said Castle Shannon senior Rachel Geraci, who plays Miss Esther Sherman, an English teacher. “He gives (the best) pep talks. (Hallam) is so well rounded, I think he can do anything. I’ve never seen him dance, but I feel like he could pull that off too,” said Dormont senior Logan Shipp, who plays Nick Piazza, an aspiring actor. Theater teaches leadership and professionalism, and it gives students, who otherwise may not move in the same social circles, a chance to interact and meet new friends. A cast that just started working together in January spoke to each other like best friends Saturday in the Michael A. Callara Auditorium. “Seeing them all in costume, I feel like the show has really come alive,” Viola said. Dressed in the clothes of aspiring actors and actresses, future ballerinas, teachers and determined musicians, each Keystone Oaks student in the show has a part, he said. “There’s no chorus in this show. Every person has a background. Every character has a dream,” he said. “Fame The Musical” runs March 31 through April 2 at the Michael A. Callara Auditorium on the high school campus, beginning at 7:30 p.m. each evening. Tickets are $7 and can be purchased at the door.